Replacing the Button BatteryIf the indicator does not come on when the button is pressed, replace the battery. 1. Remove the built-in key. 2. Remove the upper half of the cover by carefully prying on the edge with a coin. - Remove carefully to avoid losing the buttons. 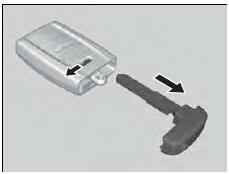 - Wrap a coin with a cloth to prevent scratching the keyless access remote. 3. Make sure to replace the battery with the correct polarity. 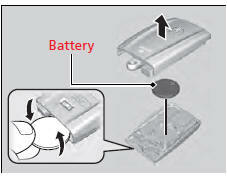 An improperly disposed of battery can damage the environment. Always confirm local regulations for battery disposal.